Sure, when we chose to move here, we thought that we were going to live the simple life. Although within miles of the hustle and bustle of a few cities, the pastoral surroundings had us convince that, once again, we'd struck it rich and would be able to call home rural. Yes, I know when the grass had begun to pop up through the straw in the fall and I got excited...really excited...because I envisioned our countrified life as beginning anew. However, right now the yard is a mess! It snowed a few times and the temperature dropped for a few days down to 7 and 9 so the ground froze. Then it, like so many other places, thawed and we got rain. Meanwhile, the entire time we have Copper. Ah, yes. Copper the ever energetic bonehead who refuses to do much of anything other than play. So what once looked like this bucolic, rural scene of peace and tranquility, has now become this...a huge mud pit with dog divots virtually everywhere! Oh, one more thing. I'm thinking about setting up a lawn chair with a fishing pole here. What do you think? 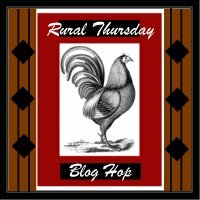 Linking up with Rural Thursday today...hope to see you there! JP, whenever we have heavy downpours, our backyard looks like a series of giant mud puddles too, but we have never seen any fish! Looks like a great place to throw in a few goldfish. Yep...mud n water do qualify rural! I see some geese too! It't all just a state of mind anyway! I Enjoyed jumping around your blog a bit. I wish I had a spot like yours. When we figured out where the rains were making a new channel through our yard, I started stockpiling rocks. And now I'm moving up the list for the services of the best heavy equipment guy in the area to dig it deeper and make me a wet-weather creek, which I'll face with all those rocks. Welcome to the country life. I have a creek that actuallly gets over my road sometimes. That's okay, I don't have to hear police and fire sirens all night. yep, I would call that rural. Yes, beautiful. Love seeing your surroundings. I think if you sit up a chair with a fishing pole, I will come bring mine and join you!